Book seats on Oxfordshire transport here or call 07890081211. Book now as seats are running out. Transport is running from Banbury, Bicester, Didcot, Abingdon, and Oxford. Seats are free to union members otherwise £12 waged and £6 concessions. Slasher Tory chancellor George Osborne unveiled £3 billion more cuts last week - on top of the £13 billion cuts already planned. The cuts will hit public services including education, transport and local government. They will make it even harder for councils to deliver key services such as social care. Together with the sell-off of the government's remaining shares in Royal Mail, Osborne hopes to make a total of £4.5 billion in "savings". The cuts are three times higher than Osborne's Office for Budget Responsibility predicted. The Institute for Fiscal Studies said the Tories were "misleading" over the scale of the cuts in their manifesto. It said the Tories would need to slash £33 billion a year to meet their promise to cut the deficit - not the £13 billion previously claimed. Osborne's budget on 8 July could unveil even more. The Tories hope to drive through savage cuts fast. They have raised the stakes. We need to do the same. Many will be shocked at the prospect of another 5 years of cuts, attacks on the workers and the poor, and an escalation of racism to divert anger away from the government. We can't afford to sit back and wait for another general election - Cameron and co have made it clear they intend to go on the rampage in the next 100 days. July will set a budget with £12 billion of cuts. We need to build resistance now. Transport from Oxford is being arranged, details to follow. 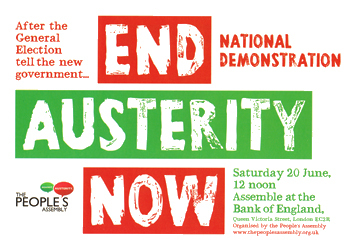 Oxford People's Assembly have called a mobilising committee meeting to build the national People's Assembly End Austerity Now demonstration. The demo is shaping up to be a massive show of resistance to the new government's £12 billion cuts programme, attacks on the right to strike and human rights, anti-migrant and anti-Muslim racism. 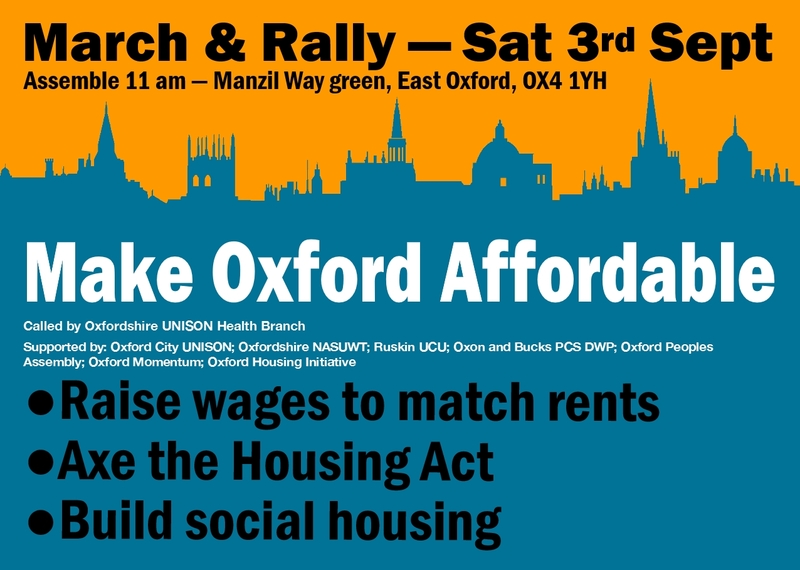 This is a fantastic opportunity to unite the left in coordinating efforts for the biggest possible Oxfordshire wide mobilisation for what will be a massive show of anti-austerity unity in the face of Tory attacks. Already union branches are sending delegates representing thousands of workers in Oxfordshire, and students. Support is also anticipated from a range of social justice campaigns. Please talk to your union branch, friends and campaign groups about coming along to the meeting to help build the biggest turn out possible from across Oxfordshire.